Vets often prescribe Acarexx, a 1% solution of ivermectin, to treat parasites including ear mites. Some pet owners prefer to mix their own solution when treating their pets. This is a guide about using ivermectin to treat ear mites. Ear mites are disgusting and painful. Cats and kittens get them all the time. Dogs do sometimes also. The vets often prescribe Acarexx. It is an ear mite treatment for cats and kittens. It contains 0.01% ivermectin. Ivomec is a 1% ivermectin injectable solution which can be bought without a prescription. It is used for cattle and swine. The one percent ivermectin is available online, and at Tractor Supply in the form of Ivomec. Like Acarexx, Ivomec contains 1% ivomectin. Rescuers and wildlife rehabbers frequently use this to treat ear mites. They use ivomec 1% solution topically in the ears. What we do with the Ivomec is make a soluton to swab the ears of kittens and cats. For kittens, the amount of Ivomec is so small that it must be diluted with mineral oil. One part 1% ivomectin or Ivomec to 3 parts mineral oil. Mix well, shake well, and the dosage for kittens as young as 4 weeks is as follows: 1 drop per pound of kitten. Most four week old kittens are one pound in weight. Adult cats get 0.1 ml for massaging in the ears. The adult cat dosage does not have to be diluted. In wild and domestic rescues, it is not feasible to go to the vets and pay for each and every cat, dog, or other animal that comes through the door having ear mites.. There could be hundreds of animals a year that come through their doors. This is also used to prevent heartworm, but we can discuss that later, so as not to get things mixed up. You will need to have a diabetic syringe (minus the needle) to measure the correct amount of Ivomec. First, carefully clean off any ear wax and gunk that is built up. I suggest trimming the very tips of the cats claws first. If not, get someone else who knows how to restrain a cat to hold him or her for you. This can be tricky. For an adult cat, the dosage is 0.1 ml slowly squirted and massaged into the cats ear canals, undiluted. Don't do it quickly where the squirt from the syringe minus the needle makes a noise. Cats do not like sudden noises. Soft and gentle and quickly is the key. Putting a towel over the cat's head like an umbrella is a trick I learned too, but it most likely won't get shaken out since it is so thick. For kittens the amount is too small to measure, so it must be diluted with mineral oil. Dilute 1 part 1% invermectin with 3 parts of mineral oil. Once the Ivomec is diluted this way then they would get 0.05 ml per pound or one drop per pound of kitten. This is to be massaged into the ear, not given orally. Repeat in three weeks to kill any mites that were not killed the first time around. It's very important to verify with your vet that your dog has an ear mite infection before using this treatment. Ear mites are relatively uncommon in dogs and they are much more common in cats. It would be dangerous to treat for mites if the eardrum was not intact or in one piece from an infection. Using a 1 cc syringe minus the needle, you administer .25 for each ear. Invermectin is very easily absorbed through the skin. You may also dilute the dog's dosage in the following way. Add 1 cc invermectin or Ivomec 1% solution to a 2 fluid ounce (60 ml) bottle. Then fill the bottle with mineral oil. Shake well before using to mix the ivermectin evenly. Apply 0.3 cc/ml to each ear and massage in. Repeat in two weeks if needed. There are about 30 ml in 1 fluid ounce, and 10,000 mcg ivermectin in 1 cc of 1% solution, so you end up with 60 ml containing 10,000 mcg ivermectin, the same dosage as Acarexx. This will be enough to treat 100 dogs (200 ears). Note that this dosage may not be high enough for larger dogs. Also it's unclear what acarexx is mixed with. Mineral oil is safe for use in ears, but ivermectin may not mix thoroughly with it, meaning that the dosage would not be the same throughout the mixture. Propylene glycol could be used to mix with instead of the mineral oil. It would distribute the amount of ivermectin evenly. If propylene glycol is put in the ears of a dog that has a ruptured eardrum from an ear infection, it could cause deafness. That is why in dogs, it is better to get a vet to make sure the dog has ear mites. I have seen lots of rescues vouch for the mineral oil mixture, so I would probably trust it more than the propylen glycol. It is your call. I hope this has given you something to think about regarding the health of your pets, and a most common problem, ear mites. Other uses of Ivomectin include heartworm prevention, as in Hartgard and a certain type of mange, and also intestinal worms. The dosages for intestinal worms and mange would be around thirty time the dosage for heartworm prevention. There are some dogs who are sensitive to this high a dose because of a genetic abnormality. That is why I will discuss these uses in a different article. Blessings, and enjoy a happy and healthy life with your pets. 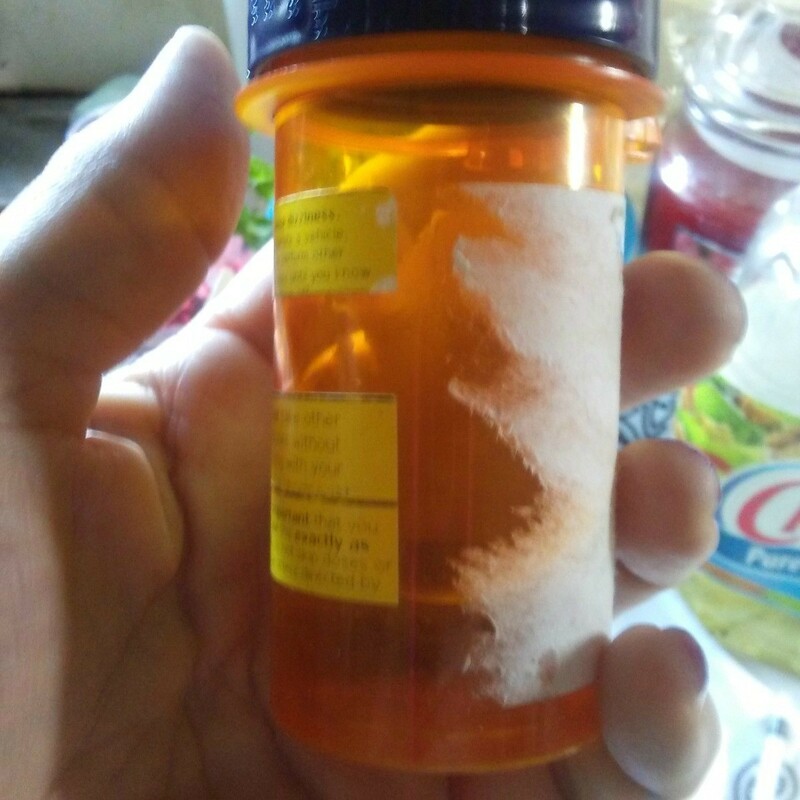 The darker pill bottles with the screw on top keep Ivermectin solution ready to use. We have a lot of kittens this summer looking for homes. I found that it was easier to mix up the topical formula and keep it ready for use in a dark pill bottle. I am wanting to use Ivermectin for my barn cats. I have 12 of them and I noticed they are having serious ear issues. Could you please explain a little better how to mix the solution with mineral oil? I am not understanding the 1% to so many parts. I want to mix a bottle so I can treat them on a regular basis. Can this also be used on the back of the neck for fleas? You must know exactly what the the ear problems are to be able to treat them correctly. All 12 may not have the same condition and may require different medications. Some of the cats and kittens may have sensitivities to Ivermectin and this can result in additional medical problems and even death. Ivermectin is also used in veterinary medicine. It is sometimes administered in combination with other medications to treat a broad spectrum of animal parasites. Affected animals are particularly sensitive to the toxic effects of ivermectin. Clinical evidence suggests kittens are susceptible to ivermectin toxicity. A 0.01% ivermectin topical preparation for treating ear mites in cats (Acarexx) is available. Re flea problems, you must be sure that Ivermectin is the proper treatment for fleas before using it for cat fleas. 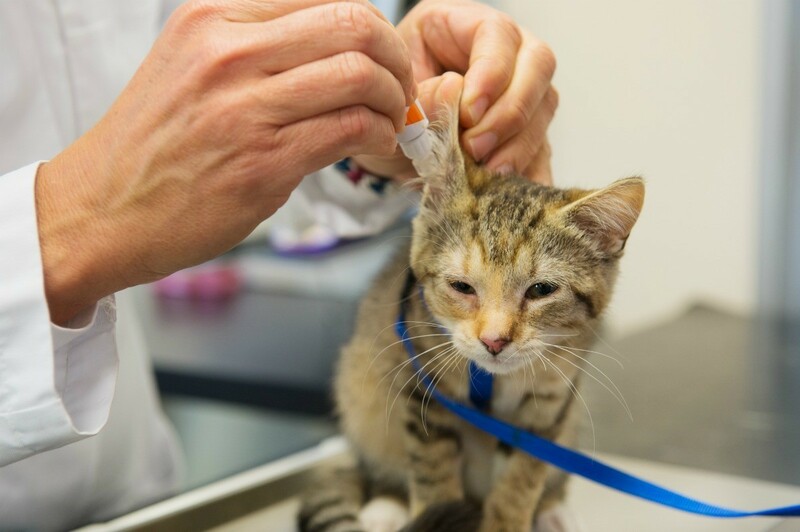 Only a vet can evaluate the cats and suggest the correct flea treatment medication. Please take your cats to a vet for the correct diagnosis and treatment. Perhaps an examination of one of the cats will help all 12. However, all 12 may not have the same problem. You'll be using your own best judgement, of course, but I had a bottle of 1% Ivermectin. Acarexx is a solution of that in ethyl alcohol - here's their page and the package insert is a PDF right there http://www.acarexx.com/. I had to use several different types and measurements of syringes (had these for diabetes). You have to be sure you know the meaning of volume for each syringe (See link #1 below). This one was key for me: 1 cc = 1 mL. You will want to check and double check your understanding before proceeding to each next step. http://www.phys  ty_percent.html. You enter info to 3 of the 4 fields and it calculate the fourth. From top to bottom, looking at the label of the ivermectin that you already have, you know that you enter 1 and click % in the field 'Stock concentration'. Skip the 'Volume from stock' field. 'Final concentration' (to match Acarexx) we want to put .01 and click %. 'Final solution volume' (Acarexx dosage is 0.5mL per ear for cats). You can pre-mix and store if your container has a good seal. For this example, we'll mix up 5.0mL so you enter 5 and leave it on the default mL. Click 'calculate' and it tells us the answer for 'Volume from stock' - how much of the Stock concentration we'll need. What you want to do next is not solved for you by this calculator -subtract the number it calculated 'Volume from stock' from the 'Final solution volume'. That's because the final solution volume is just that, the *total* volume. Here's a working example to mix down 1% ivermectin to a dose to administer topically to cats' ears: 0.05 mL of 1% ivermectin plus 4.95 mL of grain alcohol. Swirl it together for a minute. Draw up 1 mL in a *needleless* syringe or eyedropper-- Half in one ear, Half in the other. Hold your cat's head and massage it around a bit before letting them go. With our example, there is enough for five doses. Acarexx uses ethyl alcohol as a carrier. I've tried both mineral oil and now ethyl alcohol (use grain alcohol or vodka) and prefer the alcohol. The cats did not continue to be bothered by the sensation of something in their ears they way they were with the oil. I've dosed them a couple of times over a couple of months and plan to begin doing it monthly during the summer months because of the side benefit of killing any small heartworms--mosquitoes carry the heartworm larvae. It's not widely known but cats can get ill from heartworms that go into their lungs. Ivermectin is known to affect ear mites and various worms including heartworms (link #2 below). BTW, it wasn't proved to me by everything I read online that ivermectin does much for fleas. There is a wealth of information there on treating for ear mites, fleas, worms, infections etc. I would also like to add that the Pet Armour she recommends for fleas will also help with ear mites- unless it is a very serious case. Use your best judgement for anything that you read on the internet for treating your animals. Just FYI -I'd like to see somebody wrangle 12 barn cats to the vet. Not to mention what it would cost. I have a rescue and the vet actually said I could use the ivomec since I have so many cats. However, my question is which one do I buy....the injectable solution or the pour on? alcohol tends to be painful and burn if animal has had mites for extended time. They scratch the inner ear and the mites themselves leave the ears bloody and raw. Mineral oil doesnt burn. while the cats do shake their head because of the oil in their ears ~ at least its not due to pain. For fleas try mixing 1/2 teaspoon of brewers yeast per cat, into the food daily. Fleas hate the taste of Thiamine, so jump off the cats. Ive been doing this for 4 months, and not a flea on my 35 cats. even the cats with flea allergys have no bumps or scabs on the base of the tail. Is it .05ml per ear,or .10ml per ear,for adult cats? I also have a lot of cats. (Rescued,spayed,neutered,indoor). I cleaned everyone's ears yesterday,all have earmites. I have been intending to retreat w ivermectin,for months,but it is so emotionally draining and traumatic that I treated them once and didn't follow up. Now Im recommitted to finally getting rid of earmites once and for all. It is 0.5 ml per ear in an adult cat.